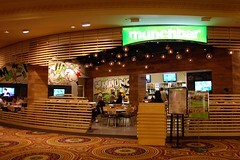 If you're looking for a good place to watch games and eat bar food in Las Vegas, head to munchbar next to the sports book at Caesars Palace. It's casual fare done with flair. The quality ingredients shine. This is not surprising as munchbar is the brainchild of Bryan Ogden, the former chef de cuisine for five years at his father's Michelin-starred, James Beard Award-winning namesake restaurant, Bradley Ogden. 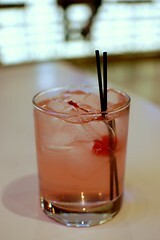 I started off with a Munch Melon -- Ketel One Citroen vodka, melon liqueur, fresh lemonade, watermelon juice ($12). It was pink and sweet and tart and refreshing and awesome. I was pleased. Mr. Monkey was pleased because munchbar seats you according to the game of your choice. Upon your arrival, the hostess asks for your team, and you get a table with a clear view of that game. I'm pretty sure Mr. Monkey was also pleased that we had a clear view of the Pussycat Dolls casino tables. Meow. We were both pleased that this was another comped meal. Chili cheese waffle fries, scallions, aged cheddar ($11). 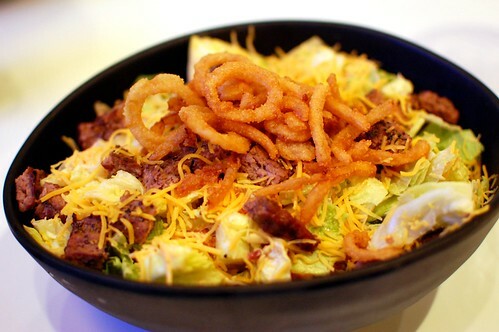 Munch Burger in a Bowl -- crisp iceberg and romaine, chopped tomato, smoked bacon, fried onions, shredded cheddar cheese, and "fancy" sauce ($14). It sounded like a good idea, but it wasn't. What were we thinking? 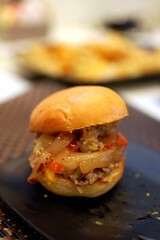 A burger is meant to be on a bun. And I don't know what makes thick thousand island dressing "fancy." I'm certain the real burger version of this would be superb. I only blame myself for this order failure. 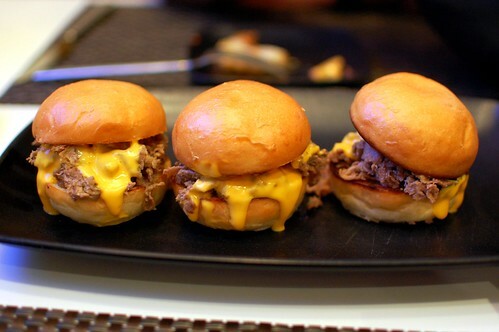 Philly cheesesteak sliders, peppers and onions, cheese sauce ($11). 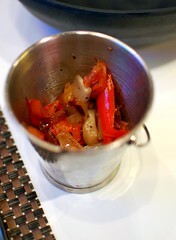 Mr. Monkey doesn't like peppers and onions, so the restaurant was kind enough to provide them separately to me in a cute little pail. I assembled my own complete slider. It was yumtastic. We would go again. 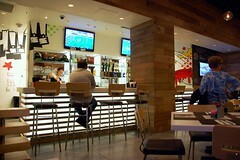 I liked dining here so much more than hanging out at a smoky sports book. And, if you really need those odds, the big boards are just next door. Mr. Bumblebee was looking over my shoulder and saw those waffle chili cheese fries and started drooling. Guess we better plan a trip to Vegas! This place sounds like a lot of fun. Thanks for the tip. I will definitely check it out the next time I'm in Vegas. 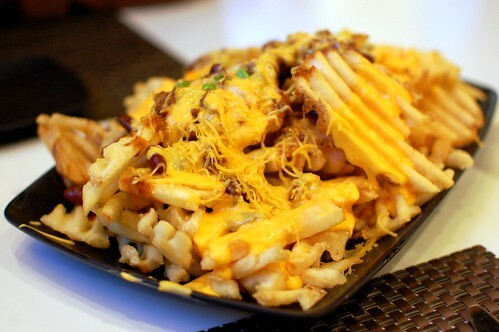 Those fries look crazy good. I must agree, the Burger in a Bowl sounds strange. we passed by last week and were wondering if it was any good. we passed because of the people we were with, but good to know. I love me some chili cheese fries. The seating arrangement it quite smart. Cool place!